Home Girl: TJ Martell - my "15 minutes"! TJ Martell - my "15 minutes"! 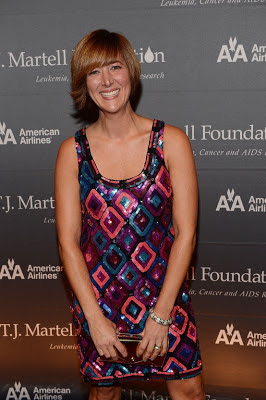 What an amazing, unbelievable experience I had being fortunate enough to be a participant in the TJ Martell Foundation's 37th Annual Awards Gala in New York City last month. The TJ Martell Foundation is the music industry's largest foundation that funds innovative medical research focused on finding the cures for leukemia, cancer and AIDS. The foundation sources and supports early stage research projects aimed at developing more effective clinical treatments for patients which otherwise might not be funded. I do encourage you to learn more about the foundation. It is very cool and the cause is something that is near and dear to me and my husband Brian. Homegirl donated a decorating consultation up for auction and I was in awe to see my silent auction item plaque next to a Carrie Underwood concert tickets/meet and greet and tickets to the Steven Colbert Show and being at the same minimum bid as them! Seriously WOW! :) I was really nervous no one would bid, but they did and I am so excited to be able to do something for this great cause. Among the other supporters at the event were, Russell Simmons, Randy Jackson (yo dawg! ), Little Big Town, Susan Lucchi, Regis Philbin, and Woody Allen. To be among their company and especially on the red carpet still to this day seems unreal! To see their pics on the red carpet "too", you can go to Facebook and search for TJ Martell Foundation under photo gallery, or on Pintrest or just Google it. Switching gears a little bit, I must admit that walking the red carpet was a little scary! To prep for it was seriously funny considering that I am not a girly girl at all. I hardly ever wear makeup, high heels or jewelry all which are a requirement for that occasion!!! My "coach" was my fashion guru sister-in-law Michelle Malik who gave me the lowdown on the "entire look" - all the way down to the color nail polish on my toes! It was a texting, calling, email frenzy between the two of us because she lives in Columbus, Ohio. While I was at the mall she was on the phone and on the internet finding my selections and giving me her approval. The best was her telling me to get a pair of shoes that little to my surprise I was holding in my hands!!! To my credit I did pick the dress and the designer of the dress ROCKS! It is a Trina Turk and Michelle was very impressed. She sent me information on the designer and an article where she was featured in a home magazine. I did love the dress and it was a blast to wear it. So there you have it, my 15 minutes! I do feel so blessed and thankful that I get to have these experiences and to pay it forward all because I am living out my passion! so cool and well deserved, Gina!!!! Bravo!! !